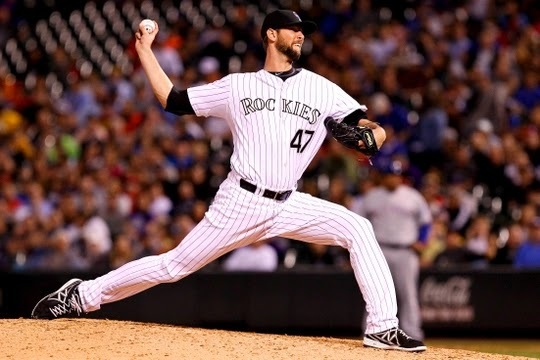 In Yankees general manager Brian Cashman’s attempt in stocking up the bullpen depth with multiple arms, the Yankees went out and acquired Chris Martin from the Colorado Rockies on Jan. 13 for cash. The 6 foot 7 and 3/4 inch right-hander will look to compete for a roster spot in spring training through the use of his mid-90’s four-seam and two-seam fastball, cutter, slider, and a “work in progress” changeup. Martin pitched to a 2.25 ERA in 42 games in 2013 with the Boston Red Sox affiliates, the Portland Sea Dogs (AA) and the Pawtucket Red Sox (AAA). Martin then posted a 4.39 ERA with an incredibly 12.2 strikeouts per 9 innings pitched with the Colorado Springs Sky Sox, the AAA affiliate of the Colorado Rockies. Martin’s short stint with the Rockies big league team in May and June yielded a 6.89 ERA with 14 strikeouts in 15.2 innings pitched in which Martin showed flashes of becoming a solid MLB reliever. We were lucky enough to contact Chris Martin in conducting an interview with him. Martin seems to be a good guy with an even better sense of humor. Here’s the interview we completed with him, enjoy! As we are just one month away from pitchers and catchers reporting to spring training, players are in the home stretch of their offseason workouts. Martin seems ready to dawn the spring training uniform and pinstripe pants in the highly anticipated competition for spots in the Yankees bullpen. With all that in mind, Martin looks to make the jump onto the 25-man roster come Opening Day. Chris, we at the BBB wish you the best of luck in the spring and throughout 2015 and look forward to seeing you in Pinstripes this season! All stats courtesy of baseball-reference.com and fangraphs.com.